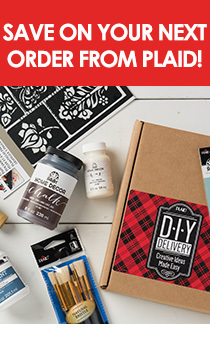 Use scraps of paper and Mod Podge to make custom gift boxes. 1. Cut a piece of Mod Podge Holiday themed paper to fit the sides of the gift box. Apply a coat of Mod Podge to the back of the paper and position around the edges of the box. Smooth any brush strokes with your finger. Wait 15 min. and top-coat with a layer of Mod Podge. 2. Create the Podgeable shape design by placing the shape on holiday themed papers, trace around the shape and cut out the design. (For this design we used one holiday shape and one 1” circle.) Apply a coat of Mod Podge to the back of the Podgeable shape and to the top of the paper, sandwich the two together, press with your fingers and allow to dry. Once dry, trim any excess paper from the edges. Repeat with the other shape. Once they are dry, hot glue together with the circle in the center. 3. Hot glue ribbon around the edge of the box. Hot glue the Podgeable shapes to the center on the lid. Hot glue rhinestones to the Podgeable shapes. PROJECT TIP: Create an antique look by using Antique Mod Podge. This will create a yellowish tint to your project.